...a Medieval village, set on a small hill over looking what were once marshlands but now replaced with fields of rice. Wander through its winding narrow streets up to the small gothic church of Sant Pere, to soak up the 360 degree panoramic view of the distant Pyrennes at one end of the valley and the sea with its jagged peaks of the Medes Islands at the other. This is Pals. It’s a special place. A stones throw from the long sandy shores of Platja de Pals, behind Masos de Pals (the modern town) is Mont Aspre - on top of which sits historic Pals. 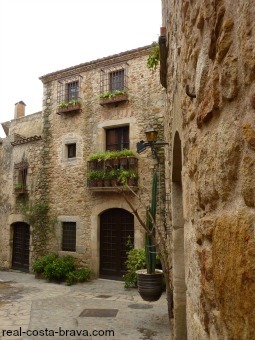 It was one of the first Medieval villages on the Costa Brava to be restored over a 30 year period (having taken a battering in the Spanish civil war). Now it is one of the most visited and best preserved historical places on the Costa Brava. Behind it’s walled barricade lies beautiful stone houses with flowering courtyard gardens that you strain to see through gaps in the gates. As well as the village itself to explore, there are a few tourist shops to potter about in selling similar wares (clothes, jewellery, postcards, pottery), the Underwater Archeological Museum and the Catalan Wine and Champagne exhibition - both housed in the Museum-Cultural Centre. Stop off at Pals Tourist Office on Placa Mayor, 7 - to make the most of your visit. Before you head back down to the beach, it is worth having a quick look at the 18th Century church of Els Masos in Masos de Pals. 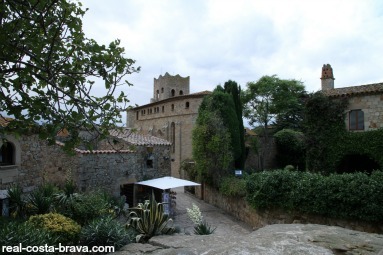 Whilst you are in this part of the Baix Emporda, it is also well worth visiting Peratallada and Ullastret - two more stunning medieval villages. At Ullastret you will also find well preserved Iberian ruins.